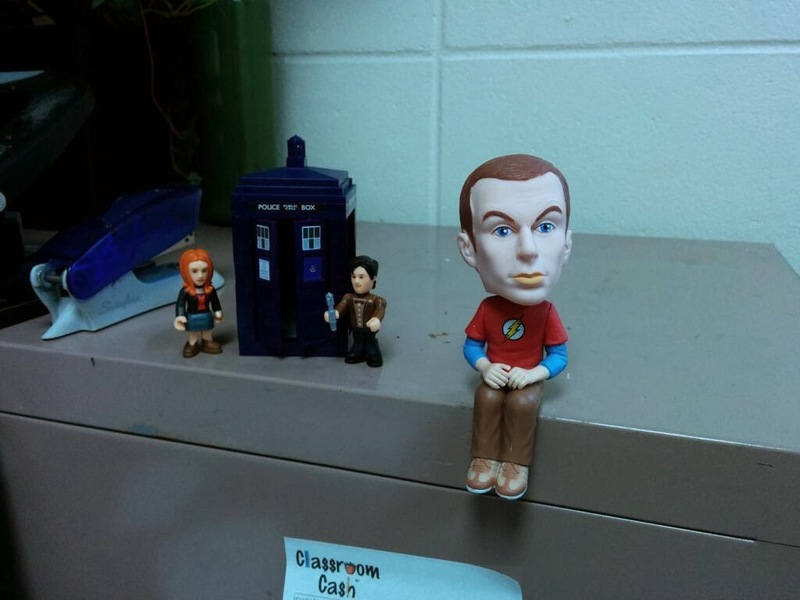 The Classroom Should be "Bigger on the Inside"
For Christmas my wife got me some stuff for my office at school, a bobble-head Sheldon from “The Big Bang Theory” and a Lego TARDIS. First let me state clearly, I know that I am a nerd and I am proud of it. I have a degree in Physics and my top hobby can be listed as technology, which is cheaper than golf lately. The only shelf in my office holds my collection of my best fossils and rocks. For those of you who do not know about the TARDIS, it is the time and space traveling ship of the Doctor, from Doctor Who. Just last year I started watching it and got hooked immediately. The TARDIS may look like a small police box but it is a lot bigger on the inside, something that almost everyone says the first time they enter it. Now lets connect this to our classroom, which is usually surrounded by 4 walls and limited by the location it is in. I have had 5 different classrooms in my 10 years of being a teacher and they all were different sizes and even shapes. Some were big while others were small with a, very poorly placed, curved wall. Proper technology integration into the classroom allows us to operate as if we were not constrained by the walls of our classroom. We can allow our students to connect with others around the world, digitally visit places that are as different from their current location as can be, simulate the solar system and even the universe all while sitting at their desk or table. Even when I had a small, curved wall classroom in central Iowa, I never felt like we only had to exist in that room. Using Google Earth we were able to visit and explore all of the volcanoes and regions we were discussing. We could see what others are currently experiencing or experienced in the past through video sites like YouTube. We could view things as they were now or even in the past, and sometimes using simulations we could see what the future will look like. We could even measure earthquakes that were happening thousands of miles away. We could travel along the ocean floor, see where the rovers have been on Mars and simulate the night sky during the day so that we could better study the sky. We could post questions to experts from around the world and get feedback before the next class period using Twitter or we could even create our own materials and have them shared with people around the globe. We could even try to bring the past into the present. I have read about how many teachers have had their students create Facebook or Twitter accounts for people who lived in the past and had them posting as they would today. They had to critically think about the topic and content before creating something new to represent what they were learning. You can do this without technology but there are so many more opportunities and ways in which you can do it with technology while increasing the effectiveness and engagement. We have to view technology as our own TARDIS, a way to move beyond the limitations set forth by the 4 walls in a specific location and have a learning environment that is truly “bigger on the inside”. January 13, 2014 in Ideas and Reflections.